Efficiently planning a complex multi-modal marketing plan, executing the plan on time and on budget, measuring and evaluating the campaign’s effectiveness, and ultimately driving higher ROI on the campaign budget can be quite an overwhelming task for most marketing departments. How can we manage the marketing program in a way that helps us keep pace with today’s consumers? How can we achieve improvements in marketing campaign effectiveness and profitability? What aspects of marketing program management would we like to see develop and improve in the future? To help answer these questions, I interviewed Douglas Long, a leader in marketing of technology solutions to businesses. Douglas has over 15 years of experience in planning, building and executing marketing strategies that significantly improve the sales performance of companies. He talks at length about his views and experience in the areas of marketing program management and project management. The following are 3 suggested areas that organizations should focus on. Steps forward in these areas can enable marketing teams to meet their strategic goals. Running a marketing program is really about running a series of project management steps. It cannot be over-emphasized that the success of the project depends primarily on the planning; executing the marketing strategy is the easier part. Managers need to ensure that all elements of the program are simultaneously well-managed for a successful campaign. They also need to focus on aligning the upstream and downstream marketing activities strategically, with the business goals. Likewise, it is crucial to include all teams during the planning phases. For example, they need to involve the sales team in the planning, as they are close to clients and will be having valuable inputs. As people become the competitive advantage for organizations, it is important that HR goes beyond its administrative support function and play a more strategic role. The role of HR should evolve such that they become involved with the functional managers and the business functions, and parallel the needs of their changing organizations. I agree with Douglas and would like to add that if needed, HR can help reshape the marketing efforts by bringing change in the organization culture through education and training, people development, etc. Marketing managers need access to sophisticated performance measurement and performance review tools and methodologies, to understand the effectiveness of the marketing campaigns. From a project management perspective, this is one area that needs improvement for accurate analysis of the effectiveness of marketing initiatives. As someone said, “You can’t manage what you can’t measure”. To further elaborate on Douglas’ comment, I think it is also crucial that the marketing metrics used should be an indicator of the business performance and align with the business outcomes. Suppose all elements of a marketing program are driven by planning, and aligned with the business goals, what would organizations see themselves doing and achieve as a result? Suppose organizations are able to accurately measure the impact of their marketing initiatives, how would that make the marketing programs more effective? What are your views and comments? If you are interested in reading more, please download the entire interview here. Ujjwal Daga is an MBA student at Schulich School of Business. Ujjwal has an engineering background and spent several years in software development before signing up with Schulich. Ujjwal is also learning about how Solution Focus fits with the world of project management. Alan Kay. Speeding up Change - Strategy. Customer & Stakeholder Co-creation. Solution Focus. Author & Speaker. 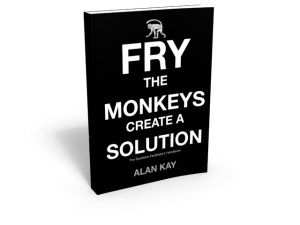 Book: Fry the Monkeys - Create a Solution. Thanks, Alan and Ujjwal. An excellent write-up of a fascinating conversation. It’s provoked a lot of thought as to how I can best articulate what it is that I do: critical in career transition!